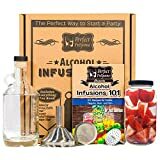 Craft and serve your very own fruit, spice, herb, or botanical infused spirits with this cool new Alkemista Infusion Vessel. No matter whether you're a budding home mixologist or a professional bartender, this unique lab-grade borosilicate vessel with a removable ultra-fine stainless steel infusion filter will have you concocting tasty custom infused cocktails with ease. It's basically as simple as steeping tea, except this time it's with booze and a little imagination. Available in stainless steel, copper, and matte black finishes and includes a handy recipe book to get you started. Check out this video to see it in action.